Genetic information being transferred from DNA to RNA to protein – this is the central dogma of molecular biology. In the standard flow of information transfer, a protein cannot build a protein, and the flow cannot be reversed. However, recently in molecular biology research, an unusual protein called Rqc2p has defied what researchers know to be the creed of protein synthesis by building on mRNA strands. 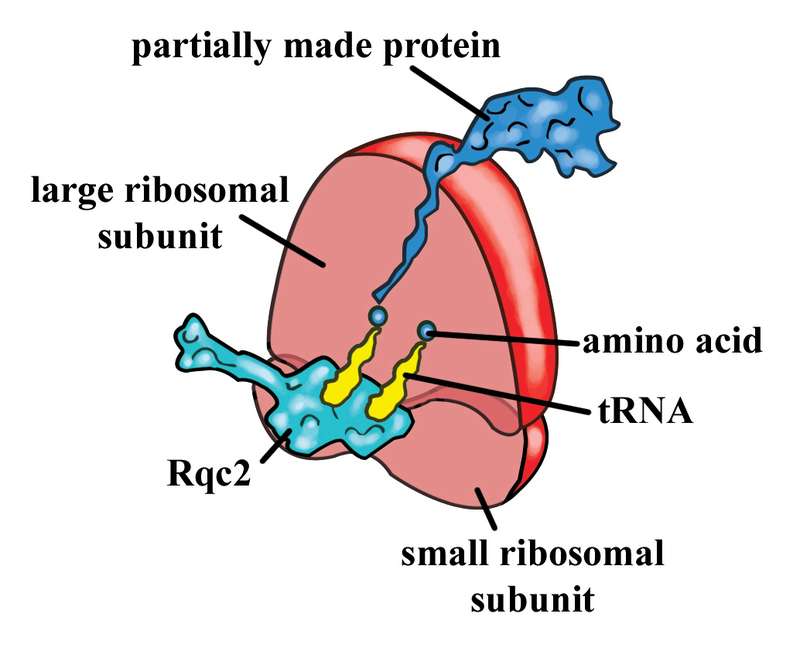 During the standard process of protein synthesis, a ribosome can sometimes stall on mRNA during translation. Ribosomal stalling results in the formation of truncated proteins that can be harmful to cells. The stalled ribosome signals for a quality control crew, of which Rq2p, a protein, is a prominent member, for recovery. Researchers have found that Rqc2p is used in an interesting process that rescues stalled ribosomes in eukaryotes, by signalling for the addition of two amino acids, alanine and threonine, to the incomplete protein. One of the most important parts of the protein synthesis process is quality control. Researchers are interested because quality control processes in neurodegenerative disorders like Alzheimer’s are often aberrant. It is hoped that understanding the functions of Rqc2p will aid in the discovery of treatments for these diseases. I like to use the analogy of a recipe book when describing the concept of protein synthesis. Our DNA is like a giant cookbook containing more than 20,000 recipes, each of which contains the ingredients to make the biopolymers we need. If you imagine a cookbook with more than 20,000 recipes, you would be imagining a very large book. To make things easier and more compact, our cells can scratch down a copy of a recipe when it is needed. This is the process of transcription, in which our cells make a temporary messenger RNA (mRNA) copy of the DNA recipe. Once an mRNA transcript is formed, it can be used as a blueprint to make proteins. This process is known as translation. A ribosome is a complex of protein and ribosomal RNA which reads the message within the mRNA to form a particular protein. Proteins are composed of linear arrays of amino acids, which are small building block molecules. The ribosome chugs along the mRNA transcript, reading the messages that indicates which amino acid is next. Translation is not perfect. Sometimes the ribosome can get stuck and stall upon the mRNA, and that is when the ribosome signals that it needs to be rescued, which involves the truncated protein being disassembled and recycled. Before the stalled ribosome is rescued, Rqc2p signals for the addition of two amino acids, alanine and threonine, to the incomplete protein. Alanine and threonine seem to be added to the protein again and again, in a random order. Going back to the recipe analogy, this would be comparable to adding half a cup of milk, then a stick of butter, milk, butter, butter, butter, milk, and so on. This finding is an interesting exception to a central dogma of molecular biology. The alanine and threonine are added to the protein without any input or guidance from mRNA. Essentially, it is protein making protein. Rqc2p appears to helps protect the cell against potentially harmful partial proteins, there is speculation that it may be involved in tagging the incomplete protein for destruction or as a test to see if the ribosome still works. The research team visualized the protein in the act using cryo-electron microscopy. They then verified Rqc2p’s function by showing that it binds transfer RNA (tRNA), the amino acid carriers of the cell, as well as finding proteins with alanine-threonine extensions at their carboxy-ends, known as CAT tails. Cellular processes which are capable of rescuing stalled ribosomes have been observed before. Some prokaryotes, like bacteria, rescue their stalled ribosomes by recruiting transfer-messenger RNA (tmRNA). tmRNA is unique in the sense that it resembles both mRNA and tRNA. The upper half of tmRNA resembles the loops of tRNA, and is attached to the amino acid alanine. The lower half of the tmRNA resembles the coding region mRNA, which is a section that can be read by the ribosome to add a particular protein tag, which targets the erroneous protein for destruction. There are similarities between these two ribosome rescue processes. Both ensure that a cell remains normal and healthy, even when translation occurs with errors. 1 Comment on "Making protein without nucleic acid"
Significant scientific finding explained in simple laypersons language.